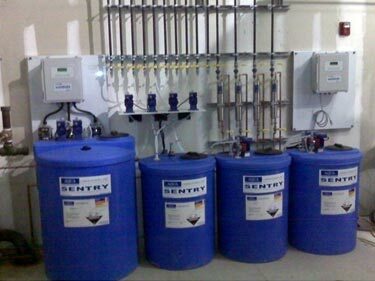 The Aqua Laboratories chemical product line is extensive, covering boiler water, cooling water, geothermal loop, waste water, and thermal energy storage applications, to name a few. We also have the capability of blending process chemicals per contract. Our formulations are innovative and highly effective – being built around the most advanced scale/corrosion inhibitors, dispersants, biocides, and cleaning agents available. We incorporate components that feature low feed rates so that our products have the smallest possible impact on the environment. In addition to our traditional liquid chemical product line, we also offer a complete line of solid chemical products that features an extremely small carbon footprint. All Aqua Laboratories chemical products are manufactured under a quality management system. Plus, we require that our raw materials suppliers also operate under a comparable quality management program. Our QC tolerance ranges are tight. This assures our clients that our products are not only the highest quality, but are consistent from batch to batch. Aqua Laboratories chemical products are easy to feed utilizing standard pumping equipment. They are designed to be fed directly from their shipping containers to minimize un-necessary handling. Most products can be easily monitored by a single analytical test. For technical or safety data information on Aqua Laboratories products contact (978) 388-3989, sales@aqualaboratories.com, or your local representative.